As advised in this previous post, a letter of complaint was sent to this Commission about Dr Timothy Tan, Cardiologist – to view this letter in full use this link. Nearly 3 months later a response was received, authored by a Ms Nada Fraser, describing herself as a “Senior Assessment Officer,” which can be viewed in full by using this link. To us this response is a disgrace – school children could do better. Our initial response to it was this, sent on 4 Apr 2019. 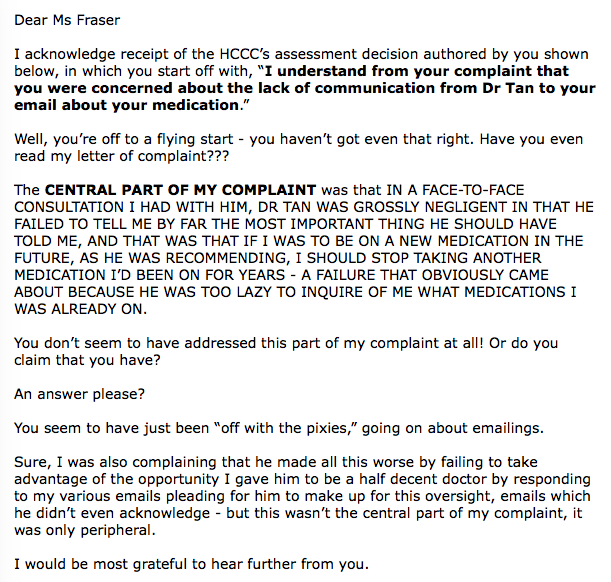 Would the senior management people in the HCCC be concerned with the quality of this response? We’ve never got the slightest indication that they might be. Would the Health Care Services Commissioner, Sue Dawson, in particular, be concerned with the quality of this response? We’ve never got the slightest indication that she might be. Would the HCCC’s political masters, be concerned with the quality of this response? We’ve never got the slightest indication that they might be. We’ll keep you advised as to what happens from here on. Perhaps, this time, things might be different.